Uncle Robby is introducing a new feature for his valued customers. The Uncle Robby VIP Shipping Club is an exclusive program that allows members to recieve addidtional benefits and perks unavailable to regular customers. FREE GROUND SHIPPING on each order you place for a year from membership purchase date. VIP membership also includes special email announcements about new products added to our site, notification of special promotions, and sales. Uncle Robby's VIP Shipping Club benefits are honored via internet orders, orders placed over the phone, as well as orders placed through email. *Free shipping applies ONLY to standard ground shipments within the Continental United States for Uncle Robby's BBQ Wood Chips and Chunks ONLY. All this for the the low price of just $39.95! Uncle Robby's wood chip blend in a tray. Your choice of our specially blended wood chips in a convenient disposable tray.Fill tray with water, wine, beer, or other liquid and poke holes in the top to let the great smoky blend enhance your beef, poultry, fish, or pork. Place on charcoal or gas grills, under the grate. or directly over the heat source for a fantastic smoky flavor. Uncle Robby's wood chips in a tray. Your choice of wood chips in a convenient disposable tray.Fill tray with water, wine, beer, or other liquid and poke holes in the top to let the great smoky flavor enhance your cook. Place on charcoal or gas grills, under the grate. or directly over the heat source for a fantastic smoky flavor. Uncle Robby's BBQ Smoking Chips are great for use in vertical smokers, bullet smokers, and stove top smokers. Wood chips are also great in gas grills to give the meat an extra burst of flavor. 150cu/in. box. Apple wood is very mild, with a subtle fruity flavor, slightly sweet. Use on poultry turns skin a great dark brown. This flavor goes especially good with poultry especially chicken, game birds, fish, and pork. Uncle Robby's Premium BBQ Smoking Apple Chips are great for use in vertical smokers, bullet smokers, and stove top smokers. Wood chips are also great in gas grills to give the meat an extra burst of flavor. Uncle Robby's Wood offers the widest variety of smoking chips. Use them at your next cookout to take your food to the next level. 150 cu/in. box. Uncle Robby's Premium BBQ Smoking Cherry Chips are great for use in vertical smokers, bullet smokers, and stove top smokers. Wood chips are also great in gas grills to give the meat an extra burst of flavor. 150cu/in. box. Hickory is the most highly used wood, both commercially and for home use. Has a strong, heavy, bacon flavor. Use on pork, ham, and beef. Uncle Robby's Premium BBQ Smoking Hickory Chips are great for use in vertical smokers, bullet smokers, and stove top smokers. Wood chips are also great in gas grills to give the meat an extra burst of flavor. Uncle Robby's Wood offers the widest variety of smoking chips. Use them at your next cookout to take your food to the next level. 150 cu/in. box. Maple has a smoky, mellow and slightly sweet taste. Good with pork, poultry, cheese, and small game birds. This flavor goes great with poultry, small game, vegetables, and cheeses. Great to mix with apple or hickory wood for smoking steaks. Uncle Robby's Premium BBQ Smoking Maple Wood Chips are great for use in vertical smokers, bullet smokers, and stove top smokers. Wood chips are also great in gas grills to give the meat an extra burst of flavor. 150cu/in. box. Pear wood is very similar to apple wood. Pear wood is very mild, with a subtle fruity flavor, slightly sweet. Use on poultry turns skin dark brown and pork. This flavor goes especially good with poultry especially chicken, game birds, fish, and pork inparticularly ham. Uncle Robby's Premium BBQ Smoking Pear Wood Chips are great for use in vertical smokers, bullet smokers, and stove top smokers. Wood chips are also great in gas grills to give the meat an extra burst of flavor. Uncle Robby's Wood offers the widest variety of smoking chips. Use them at your next cookout to take your food to the next level. 150 cu/in. box. Uncle Robby's Premium BBQ Smoking Pecan Wood Chips are great for use in vertical smokers, bullet smokers, and stove top smokers. Wood chips are also great in gas grills to give the meat an extra burst of flavor. Uncle Robby's Wood offers the widest variety of smoking chips. Use them at your next cookout to take your food to the next level. 150 cu/in. box. Plum wood is good on almost all meats.Plum iIs a milder and sweeter version of apple wood. Great wood for mixing to give a bit of a sweeter taste to ribs. Uncle Robby's Premium BBQ Smoking Plum Wood Chips are great for use in vertical smokers, bullet smokers, and stove top smokers. Wood chips are also great in gas grills to give the meat an extra burst of flavor. Uncle Robby's Wood offers the widest variety of smoking chips. Use them at your next cookout to take your food to the next level. 150 cu/in. box. Spice up your next BBQ with Uncle Robby's BBQ Smoking wood blends. Made specifically for each type of meat, Uncle Robby's BBQ Smoking Blends are custom mixed to each meat wheather it be pork, beef, poultry, or fish. Each blend is mixed with the finest wood varieties to enhance the flavor of the meat, not overpower it. Each box is specialy blended with wood chips to bring out the best tasting food on your grill or smoker. Don't worry about blending woods yourself to get that perfect taste. We do it for you in every box. Chips=150cu/in box. 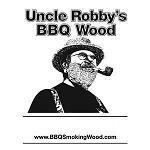 Uncle Robby's BBQ Smoking Woods are now available in mixed boxes. Do you like to use a combination of apple and hickory chips when you cook chicken? or a combination of cherry and maple when you smoke ribs? If so, Uncle Robby's mixed wood chip boxes are the way to go! Pick your favorite blend of wood chips to cook at your next competition or family gathering for a whole new taste. When ordering specify what two flavor wood chips you would like combine in the drop down menu. Chips=150cu/in box. Try Them All! Uncle Robby's BBQ Smoking Wood makes food taste better each and every season. The Woods of the Season Club gives you the opportunity to try all of our fantastic flavors of wood. When you join the Woods of the Season Club you also save on the price. Shipping is included in the one-time payment price of $219.95! With Uncle Robby's Wood Woods of the Season Club you can try 3 new wood each of the four seasons of the year with out the hassle of ordering 12 times. 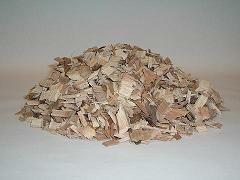 Each season/quarter we will automatically ship you 3 boxes of our wood chunks or chips for you to try (you choose). When you make this purchase you will not have to worry, we will ship you 3 different varieties of wood each season for a year. 12 different wood flavors in all. Email us if you cannot find what you need.